Bridesmaids walk along the cobble stone entrance of the Old Crown Point Courthouse. As a wedding photographer who services Chicago, southwest Michigan as well as Northwest Indiana I see a lot of different wedding venues. Usually a few times a year though I travel a mere 5 minutes to the Old Crown Point Courthouse for everything from Bridal Portrait Sessions to engagement sessions and of course weddings. Today’s post is all about Crown Point weddings, specifically the Old Crown Point Courthouse and Maki Ballroom. Bride and groom portrait on the third floor balcony of the Old Crown Point Courthouse. Bride at the top of the staircase at the old Crown Point Courthouse. An historic building that was erected in 1878 is going to give a photographer many different opportunities to stretch their creative muscles. The third floor is home to the old city court and is where the ceremonies take place. Just outside in the hall is the vintage floor with it’s balcony as well as wonderful window light with darkened staircase. I’ve had many couples “go retro” with a vintage styled wedding. Kelly and Matt went all out with a 1920’s theme complete with paperboys, vintage wedding dress and more. Other clients simply let the Romanesque stylings of the landmark property provide the sole backdrop. 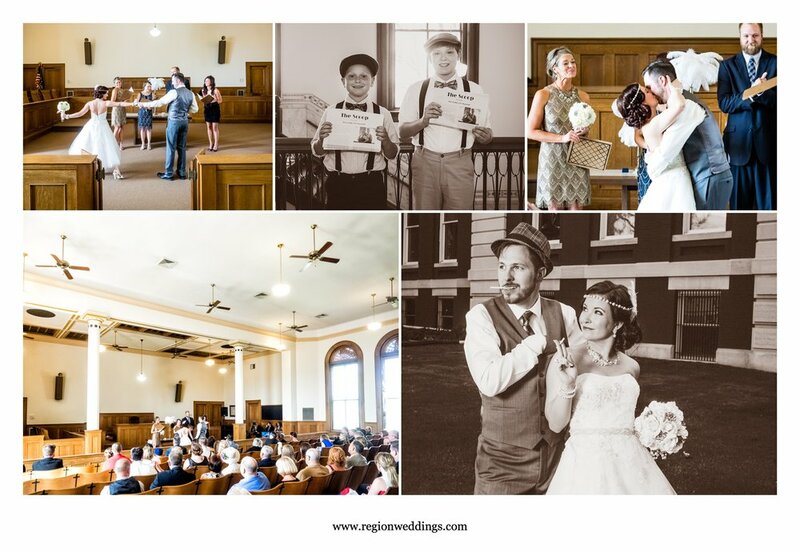 A 1920’s themed wedding at the Old Crown Point Courthouse. Wedding ceremony at the Grand Old Lady, aka the downtown Crown Point Courthouse. The outside area of downtown Crown Point (especially now with all of the aesthetic improvements taking place), is popular for wedding photos no matter where the ceremony. Often when I shoot at nearby St. Mary’s Church we will walk down to the Crown Point Square for pictures. Bride and groom outside the Hall of Justice in downtown Crown Point, Indiana. Wedding photos in downtown Crown Point, Indiana. Bride and groom kiss in front of the Grand Old Lady in downtown Crown Point. 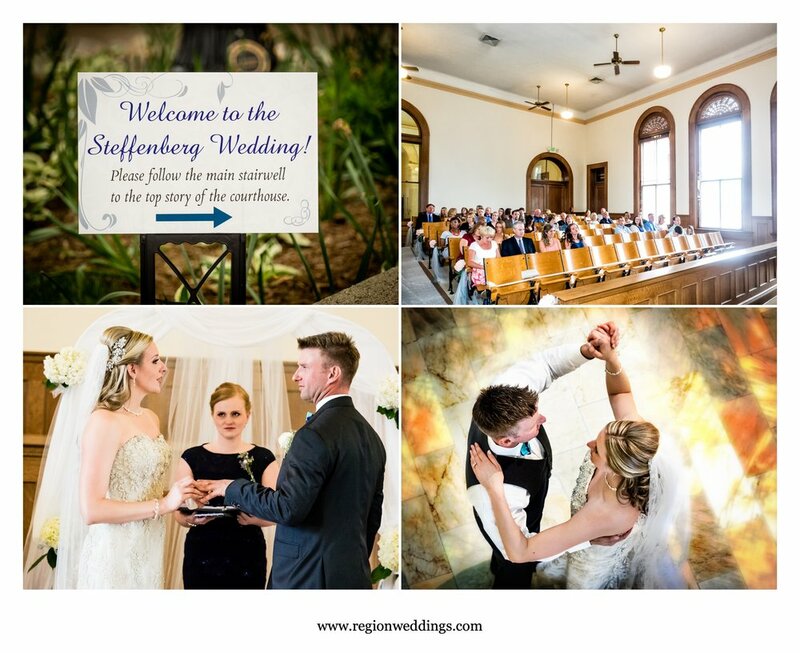 Bride and groom dance within the elegant first floor of the Old Crown Point Courthouse. By booking the Maki Ballroom you will have access to the basement area of the historic building with it’s unique brick and jail cell backdrops. The beautiful chandeliers adorning the ballroom look great in first dance pictures. Wedding receptions at Maki Ballroom in downtown Crown Point, Indiana. 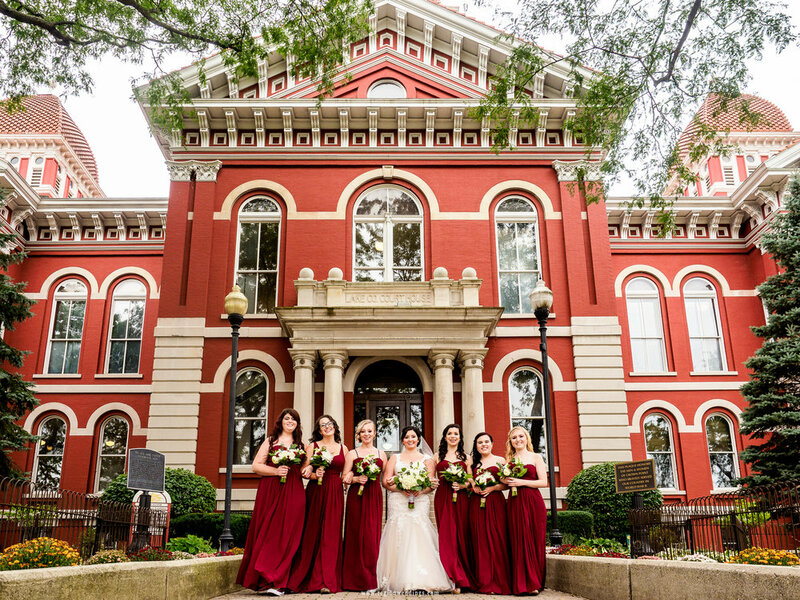 Whether or not your wedding is taking place at the Old Crown Point Courthouse or not, please do fill out the Contact Form here to inquire about wedding photography for your big day. I hope you have enjoyed this look at various weddings in and around downtown Crown Point. A romantic stroll through the woods of Gabis Arboretum. Noel and Kennith bundles up in their winter clothes for a chilly, but fun engagement session at Gabis Arboretum in Valparaiso, Indiana. I had them taking romantic strolls though the woods as well as cuddling up on the edge of the frozen lake. Romantic engagement photos taken in winter. While I certainly do “staged” photos, I also try to make those appear natural. I also tend to have my clients take a break during the session and sit down and talk for bit. This makes for some nice candid moments to capture. Candid moments during a winter engagement session in Northwest Indiana. A kiss in the woods. Noel said she really wanted a wide shot showing off nature (and her and Kennith too) and we most certainly did some of those as well as focusing on her ring. 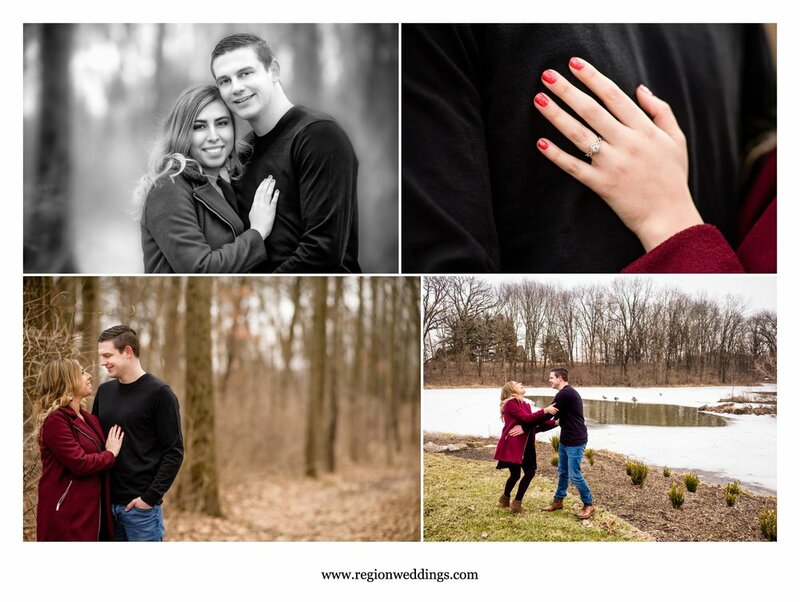 A winter engagement session at Gabis Arboretum. A young couple in love during their winter engagement photo session. To schedule your own engagement session or to inquire about photography for your wedding, please fill out the Contact Form right here. To see more engagement pictures as well as wedding images in Northwest Indiana and Chicago, please visit the Region Weddings Instagram page right here.